Papa Terra field is a heavy crude oil field in block BC-20 of the Campos Basin. The Papa Terra field was discovered in 2003 with the drilling of five wells. The field is estimated to contain 700 million to a billion barrels of oil equivalent. Papa Terra field is a heavy crude oil field in block BC-20 of the Campos Basin. 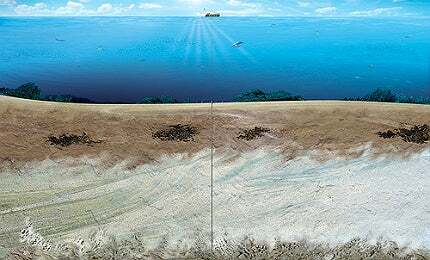 The field lies at a water depth of 1,190m, 110km offshore of Brazil. Petrobras operates the field with 62.5% interest. The remaining 37.5% interest is held by Chevron. High viscosity and low API were the key factors hindering the development of the field. The partners made the final investment decision in January 2010 and will invest $5.2bn on the field’s development. First production occurred in November 2013. The P-61 tension leg wellhead platform (TLWP) at the field started production in March 2015. It is the first of its kind to operate in Brazil and also the first Brazilian offshore platform to use dry tree technology. "The partners made the final investment decision in January 2010 and will invest $5.2bn on the field’s development." The Papa Terra field was discovered in 2003 with the drilling of five wells. The field was declared commercial in 2005. The field is estimated to contain 700 million to a billion barrels of oil equivalent. The crude oil has an API index ranging between 14° and 17°. About 380 million barrels of oil are expected to be recovered from the field. The field is being developed using 29 bore wells, including 16 wet completion wells and 13 dry production wells. The wet completion wells will include six horizontal producers and ten water injectors. A total of 13 heavy oil production wells are being connected to the P-61TLWP. The light oil production wells are being connected to a floating production, storage and offloading (FPSO) vessel called P-63. The P-61 TLWP was designed by FloaTEC and will be installed in 1,180m of water. The platform includes a dry tree, top tensioned risers and a tender assist drilling rig moored nearby. It supports all the well drilling and workover activities, as well as exports the production to the P-63 FPSO. Its topside was built at Keppel Fields shipyard in Singapore, while its hull and mating operation were performed at the Brasfels shipyard in Rio de Janeiro. It was transported to its final location in late 2013 and installed by April 2014. The platform’s first well PPT-16 started production in March 2015. The production from P-61 is transferred to the P-63 by means of flexible lines. The P-61 TLWP is also equipped with a drilling and well completion rig. The BW Nisa vessel was converted into the P-63 FPSO for use at the Papa Terra field. The vessel is 334m-long with a width of 57.3m. It has a capacity of 323,000dwt and was installed at a depth of 1,200m. It started producing oil in November 2013. Conversion of the vessel included installation of 16 topside facilities weighing 14,000mt. The units deployed include three oil processing units, a gas compression unit, three power generations systems and two manifold modules. A flare unit, utilities facilities and two water treatment and injection units were also installed. The topside modules process 140,000 barrels a day (bpd) of oil and 35 million standard cubic feet a day of gas. Seawater injection capacity of the FPSO is 340,000bpd. The platform is connected to the production wells by means of subsea flexible pipes. FloaTEC Singapore, an equal partnership company established by Keppel FELS and J Ray McDermott, built the wellhead platform as part of a $1bn contract signed in October 2009. "The Papa Terra field was discovered in 2003 with the drilling of five wells. The field was declared commercial in 2005." Keppel and J Ray McDermott carried out design, engineering, construction and installation of the platform and will operate it for three years. FloaTEC provided basic engineering services and supply risers, tendons and other equipment for the platform. A consortium of BW Offshore, QUIP and QGOG was awarded the contract for constructing the P-63 FPSO in February 2010. BW Offshore provided conversion services for the hull, offloading units and mooring systems. QGOG and BW Offshore will operate the FPSO for three years and later handover the vessel to Petrobras. QUIP was responsible for the topsides of the FPSO. The contract to carry out the basic engineering services for the topsides of the P-63 FPSO was awarded to AMEC. BW Offshore subcontracted Inocean to prepare the technical drawings and documentation for class approval of the FPSO, and in February 2010, AMEC was contracted to provide engineering services for the topsides of the FPSO. Wärtsilä was awarded a contract to supply three power modules for the FPSO in May 2010. The modules include two 18-cylinder 50DF tri-fuel engines, alternators and other ancillary equipment. The modules have been installed and the vessel completed load tests in January 2013. Veolia Water won a contract to supply a water treatment unit for the FPSO in August 2010. The treatment module is used to separate sulphates and other chemicals from the injected water, to improve oil recovery. In October 2010, Dril-Quip won a $28m contract to provide subsea wellhead systems for the field. Deliveries were made by 2013. Technip won a contract to supply 27km of risers, flowlines and an electrical module for the FPSO in October 2010. Classification society ABS will class both the TLWP and FPSO. ABS will review the design of the FPSO, hull, mooring systems, production and other equipment to ensure that they comply with the relevant standards. The Peregrino field is located in the Campos Basin area, 85km offshore Brazil. Waimea oil field is located in the BM-C-41 block in the Campos Basin, 80km offshore of from Rio de Janeiro in Brazil.